Two rivers. Two countries. Two guides. Chris Harvie finds two trips equally wonder-filled. Ngepi Camp in Namibia and Tamarind Camp in Zambia are camps with personalities: Christoph Tuuyendere and Lawrence Chidakwa respectively. Two gentlemen with some very useful skills. Ngepi Camp, spectacularly sandwiched between the Bwabwata and Muhango National Parks on the River, lies at the western end of the Caprivi Strip. The game may not be thought prolific, but we saw sable, giraffe and baboons as we drove in; lions are audible at night and elephants easily visible from the camp by day, along with numerous buck. It is, however, for its birding that Ngepi is rightly famed. The more earnest side of this camp manifests itself in its occasionally-overstated concern for the environment but this is countered by some of the best-situated and most humorous loos-with-views in the world. The signage throughout the camp alone is worth a tour and all this foolery can be combined with a game of Ngepi Frisbee golf amongst the trees. You need to go there to understand the rules! The main man at Ngepi is Christoph Tuuyendere, who explains that he is one of only 70 000 people still speaking his language, most of them living here along the Okavango River at the very top of the panhandle. His people have, he says, strong ties binding them together in a respect-driven culture which is inextricably linked with their river. They are tight-knit bunch, the Hambukushu. Intelligent and worldly Christoph might be, as he talks his guests through their bird-sightings in his mellifluous tones, but he is equally fascinating in his belief, for example, that the best time to swim in the river is during the winter when the grass is white with frost, because when you get out, the air seems relatively to be that much warmer. And he is not shifting on that one. In the morning, we head downstream with the dawn and Christoph in a mokoro, a glint of smiling teeth beneath his unlikely dreadlocks. Strings of birds later – spotted crake, sharp-tailed starling, chirping cisticola, purple heron – he stops on an island and we take a walk. After a lunch of environmentally-friendly kudu-burgers, binoculars in hand and seated on the restaurant deck, we are unable to resist another boat trip, this time upstream on a motor launch. My companion casts a line in the river for tigers, unsuccessfully as it turns out, but Christoph is no fisherman and neither am I, so we clock up a few more bird species instead. Slaty egret, long-toed lapwing and finally, a bird for which I have scoured the continent, a racket-tailed roller. As the sun goes down behind a mess of multi-coloured fluffy clouds, a Tafel beer in hand and chewing some biltong, I agree with Christoph that there are fewer better ends to the day than sitting on a river. Behind us, but not very far behind, a pod of hippos rises yawning from the slow-moving water in a salute of air-shattering grunts. Lawrence Chidakwa, unlike Christoph, is not measured in his tones. He is an ardent and eloquent local politician. He too, though, is a fine host. Tamarind Camp looks out from Zambia over the Zambezi to the Charara Safari Area in Zimbabwe. Towering tamarind trees offer great swathes of shade, under which lie the tents and chalets, stretched along the high riverbank, with views up and downstream. The thatched bar peers over the river through the canopy and, in the evenings, the team lights a huge fire around which to sprawl and eat fresh fish. It is a tranquil spot that lends itself to quiet contemplation. In keeping with his environment, Lawrence is a deep-thinking man of passion, a great birder and even more than that, an accomplished fisherman. Something, therefore, for everyone, as our trip up the gorge in a banana boat yields first a flurry of blue-cheeked bee-eaters looping in and out of the orange-striated cliffs in the warming morning sun, then Zambia’s national bird – yes, the fish eagle again, just like Namibia’s – calling high above us. Lawrence can’t mimic birds the way Christoph can but he doesn’t need to. He knows his fishing spot, a couple of kilometres upstream towards Kariba, where the river below the rapids erupts with tigerfish. The fish eagles are waiting for him there; half a dozen of them, sweeping up from the trees then swooping down low over the water, bombarding the live bait every time it is cast with the line. This doesn’t put off the tigers, who are gutsily taking the bait themselves. Inevitably some big ones get away and one almost pulls Lawrence into the Zambezi but my fishing buddy, to his immeasurable delight, lands a 4kg specimen for supper, along with numerous others to feed the team who will kindly remove the bones. We head back to camp a few hours later as the day warms up and Lawrence warms once again to his theme of the moment – the inadequacies of the Zambian education system. A midday walk along the riverbank yields 20 bird species in as many minutes and an evening trip downstream is another maelstrom of hippos and tigerfish with fish eagles overhead. While the birding may not match Ngepi’s, the scenery and the fishing more than make up for it and Lawrence is just as passionate as Christoph about his people, his country and his craft. This time, at Tamarind, the sun is a big golden orb that turns the water a silvery blue, the beer is Mosi and the river fast-running with banks full of fishermen catching their evening meals. But the theme is the same, no matter which camp we find ourselves in – a river, a fundi, a beer at sunset, birds and tigers. In Africa. Ngepi Camp, near Divundu, Namibia. 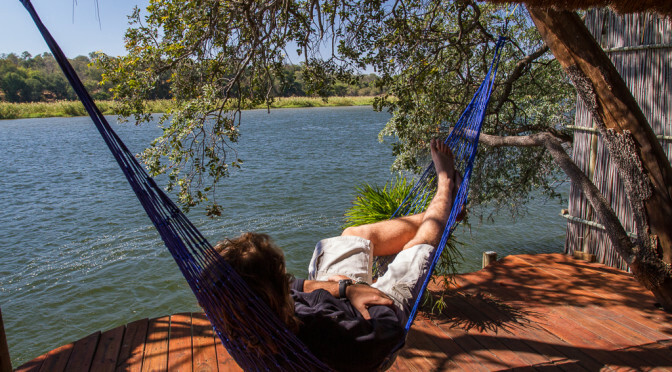 Camping and a variety of tree-houses, tents and decked huts along the banks of the Okavango River. Camping R95 per person. Bush huts from R420 per person BB. Good simple food and a lively bar. Piping hot showers and funky baths. Quirky but fun. Three permanent tents (with ablution block) and two en-suite chalets. Tents US$50/day and chalets US$70 per day. Bring all food and drink. Chefs will prepare your meals for you. Provided: gas stove, braai stand, crockery, cutlery, pots and pans, glasses, linen, chairs, tables. No electricity. Lighting by paraffin lamp or client-supplied candles. Hot water. A copper bar 7 seater boat (banana boat) can be hired with a coxwain (Lawrence) for sight-seeing and fishing trips at $70 per half day. Tiger-fishing at its best. Bookings Tel: +260 211 266400/266431 Email: anderson@zamnet.zm . No website.